September | 2011 | Where in the World Are Our Kids? We found out yesterday that there have been some delays in the processing of adoptions in the Democratic Republic of Congo. One problem is that some personnel have changed, including a judge who is very new at processing adoptions. Fortunately, he’s willing to learn and has a favorable attitude toward adoption, which is very good news. The other problem with our timeline is likely going to change with the elections in November. The US Embassy has indicated that they expect adoption travel delays, but aren’t sure how long the delays may be. So while we were originally planning to travel by the end of the year, now we’re expected to travel before April. We hope. The good news is that we received our “Notice of Favorable Determination Concerning Application for Advance Processing of Orphan Petition.” This is the last piece of documentation we need before sending our paperwork to the Democratic Republic of Congo to begin going through their process — the one that’s currently delayed. We hope to put our dossier together and mail it off by tomorrow! The Bible talks about hungering after righteousness, after God. The trouble is that hunger is not a very comfortable situation in which to be. I’ve often thought about wanting to hunger and thirst after God as something good, something pleasant. But hunger, by its very nature, is painful. There’s a big difference between a desire and hunger. Hunger goes beyond desire to a physical discomfort of craving. A bowl of salted caramel ice cream sounds good to me right now. One could even say that I DESIRE to have at least a spoonful. But am I hungry? No. No hunger pangs. No stomach rumbling. But if I eat the desired salted caramel ice cream, I actually shortcut hunger. Ken Gire speaks on the subject of spiritual hunger in The Reflective Life. My pain. My cave. My wilderness. These create a true hunger. There’s no easy substitution for hunger. In a world of self-sufficiency, my faith can be hampered by shortcutting hunger. Do I snack on the spiritual experiences of others, rather than working through and learning from my own? Probably more often than I’d like to think. In the same way that eating at the first desire for food without true hunger creates overweight people, feeding off of the experiences of others without allowing true hunger for God creates overfed Christians. How do we create true hunger for righteousness rather than snacking on the experiences of others? Many times we find ourselves in stages of life in which we tangibly feel the need for God’s healing or provision. I think at times we have to carefully and prayerfully create vacuum of need that only God can fill, not by sinning so that “grace may abound,” but by stretching ourselves outside of what is spiritually, physically, or financially comfortable. Perhaps by supporting a ministry financially when we’re not sure how God will provide for our needs. Maybe by engaging in spiritual disciplines, like fasting, that remind us of our hunger for God. Possibly attempting something that without God’s help would be a sure failure. So here’s what I’m contemplating: How am I continually cultivating a hunger for God? And by “you,” I mean moms who work full-time outside the home, manage a family, volunteer for ministry opportunities, and still keep your sanity. It’s something that I’m thinking a lot about these days, because I know my days are about to change. My work plate is filled and spilling over. I love what I do, and I love my students, and this is all fortunate because we can’t afford for me to quit! At the same time, by the time 5:30 rolls around and it’s time for me to head home, I am tired! Make and dinner, walk the dogs, daily housework chores, find a few moments to read and reflect, work on projects for church and/or our adoption, find a few words to write, and the day is done. How do I add in two children to the mix? Sports practice, music lessons, homework projects, church activities, creating special memories. My head is spinning with just the thoughts. So, moms of the world, help me. Okay, even dads too. Give me some words of wisdom. As a family, how do you balance family with two full-time jobs and church activities? Yesterday our church choir and band put on an amazing musical. It was powerful, inspiring and God-honoring. The band was incredible, the choir was energized, and the soloists blew my socks off. One song in particular captured my attention. Actually it was one line. The song exalted the names of God. One title in particular: Alpha and Omega, The beginning and the end. I have heard those words describe God countless times before. But this time “The End” really grabbed a hold of me. Not a particularily fancy title. It’s not like… Bright Morning Star, Consuming Fire, or Lion of the Tribe of Judah. I must admit, I am more comfortable thinking of God as the Beginning. The Creator. The One who spoke all things into existence. Rarely do I think about the God who stops time. The One who finishes what He started. But yesterday my mind was racing as I thought about God as The End. If God is “The End,” then so many other things are NOT the end. 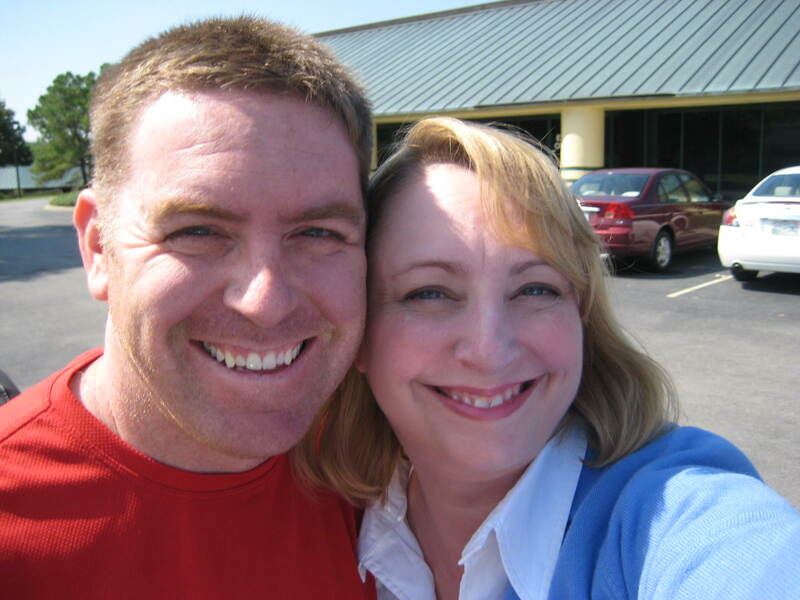 The spouse who says, “It’s over. I am not in love with you anymore.” That’s not the end. The doctor says “It’s cancer and there’s nothing more that can be done.” That’s not the end. The foreman says, “We’re downsizing and we have to let you go.” That’s not the end. Today as I sat in a funneral service. I heard family and friends recount the life of a faithful and godly man. The truth rang out powerfully: even death is not the end. We may put the body in a box. Bury it in the ground, but that’s not the end. Not even close. The Bible talks about this life as a moment. Compared to eternity this is the bat of an eyelash. When we put our faith in God, we acknowledge that HE IS THE END. Our circumstances do not dictate how we live our lives. We orient ourselves around the one who truly has the final say about ALL things. We may not always get our way, but we are not controlled by the things of this world that seem to be final. They are not. He is. It may have only been a couple of syllables in the midst of a powerful and stirring musical performance, but what an amazing truth: GOD IS THE END AND NOTHING ELSE EVEN COMES CLOSE! Tis the season for t-shirt crafting! Target recently had some of their super-soft scooped neck t-shirts 75% off, and at Big Lots this past week, plain t-shirts were marked down to just 75 cents! I wish I could say that everything went smoothly with this project, but it took two tries, including a step in the middle where I bleached the shirt back to white and started over. I’ll try to be detailed in my instructions so you can avoid the same level of pain, frustration, and stain. Lessons I may or may not have learned will be reflected in italics, ahem. 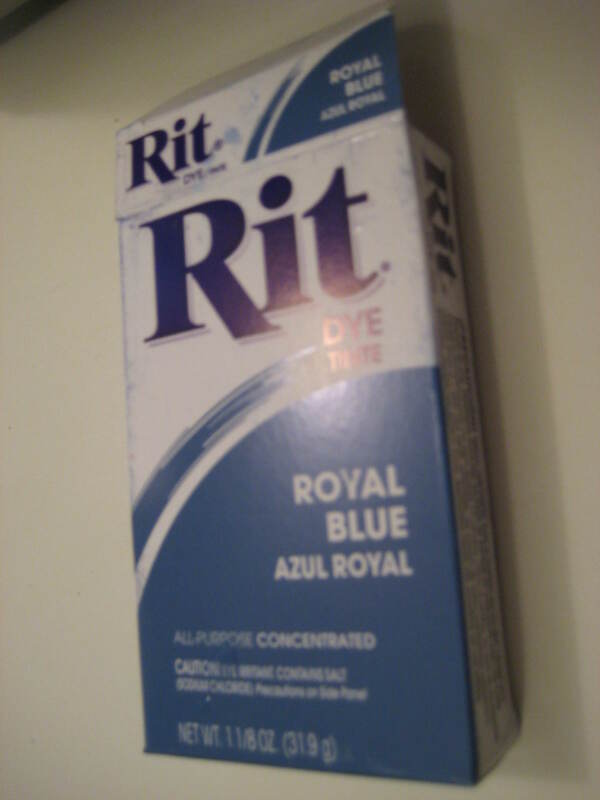 I started with my Target $2.50 t-shirt, some Elmer’s blue gel glue, and a box of Rit dye. The shirt was originally going to be pink, but when I lifted up this box, it had left blue speckles of dye on my nice white shirt. Blue it is! Wash the t-shirt, but do not add fabric softener, and let spin dry in the washer. While still wet, place the shirt over a water resistant surface to protect the back from the shirt. I used the lid of a 5 gallon plastic tote. 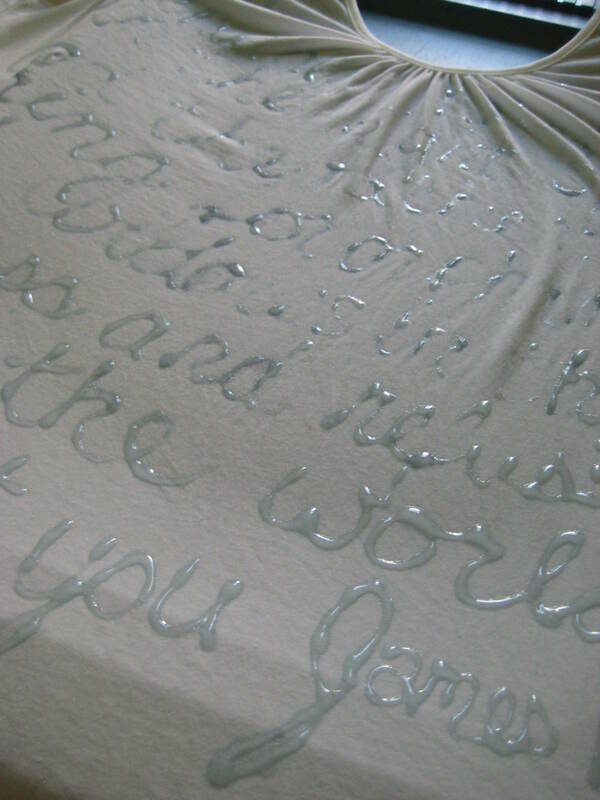 I sketched out a proposed layout of the words, and then followed the basic pattern, more or less, by writing on the t-shirt with the gel glue. CAREFULLY remove the shirt from the board taking care not to smear the glue and hang to dry, preferably outside. It will take at least 4 hours to dry, or overnight. Put on clothing that you really don’t care about, or that you’d like to turn into a freckled mess. Mix Rit dye powder in hot water (I used 2 tsp. ), then pour into approximately one gallon of cold water. The dye powder needs to dissolve, but you don’t want the glue on the shirt to dissolve. 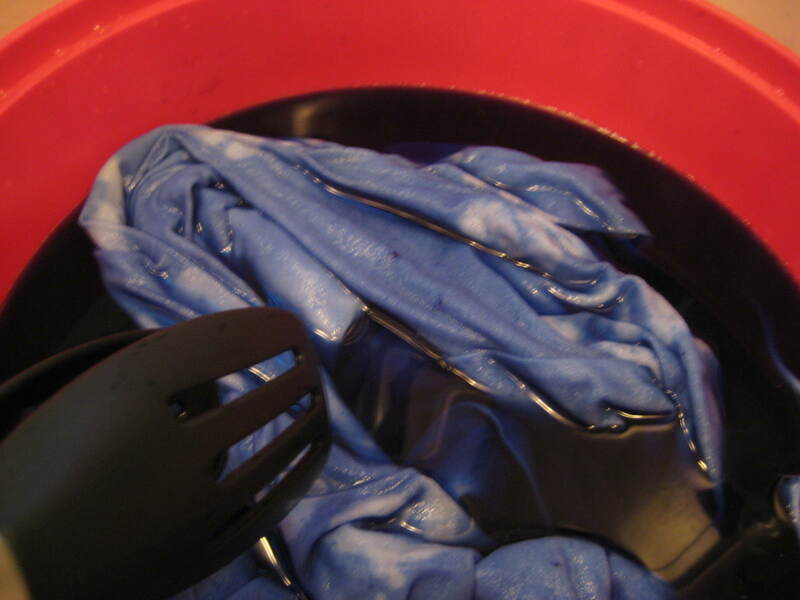 Carefully submerge the shirt in the dye bath and let soak for 10-30 minutes, depending on the depth of color you want, how much patience you have, and how much you trust your glue to hold. 😉 Stir gently, but occasionally. While you’re letting it soak, use bleach spray to spray down every counter and floor surface that you looked at or breathed on while making the dye bath, otherwise you’ll be surprised for the next week about all the flecks of dye that turn up in unusual places. 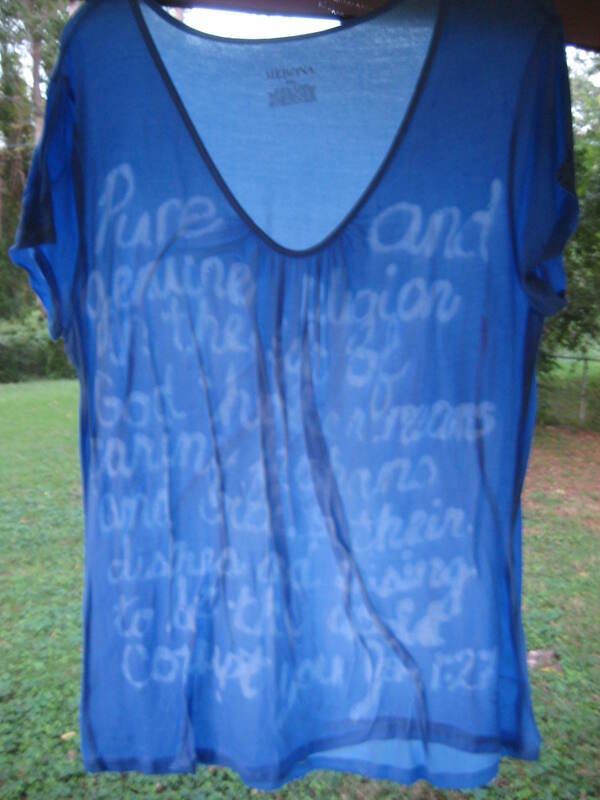 Carefully remove t-shirt from the dye bath, and hang to dry in a place where it’s safe to let it drip dry. (Like outside above a patio that you don’t mind if it’s stained blue.) Let dry overnight until completely dry. The glue will appear speckled with dye, which will wash out. One does not need to start over because of the speckles. 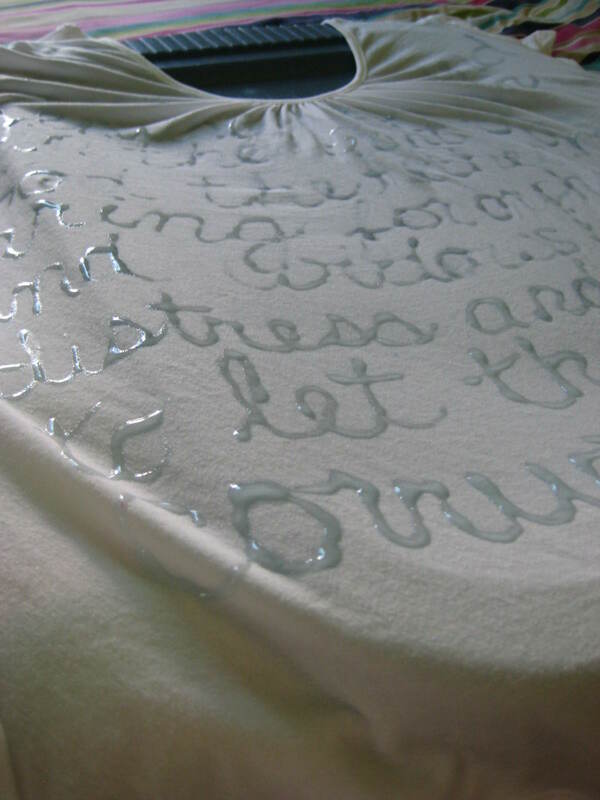 Gently rinse the shirt in a cool soapy bath to remove the glue. Rinse several times, until water runs clear. Wash as usual, and dry. Back in the olden days, when I used to shop at Walmart, my favorite section was the fabric department. More specifically, the fabric clearance. 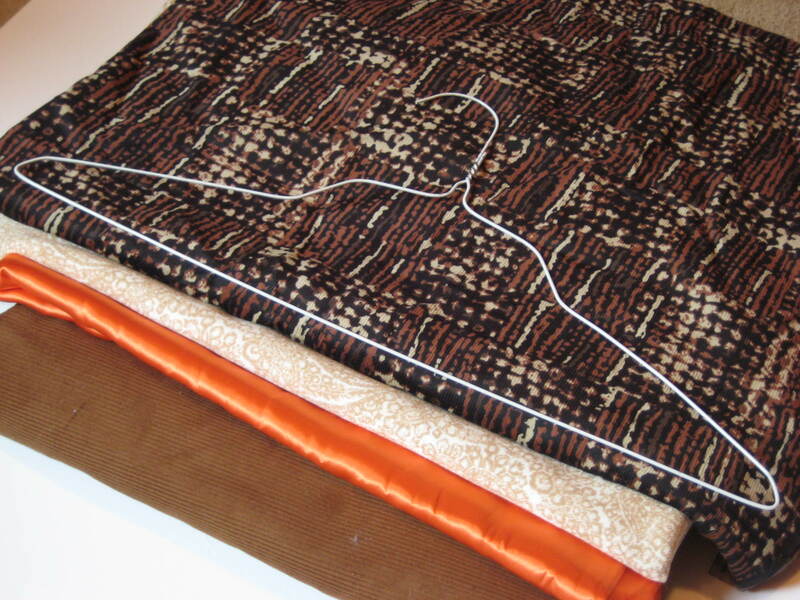 They always had bolt after bolt of fabric at bargain prices, much of it $1 a yard. I made curtains, pajama pants, skirts, and various other projects. 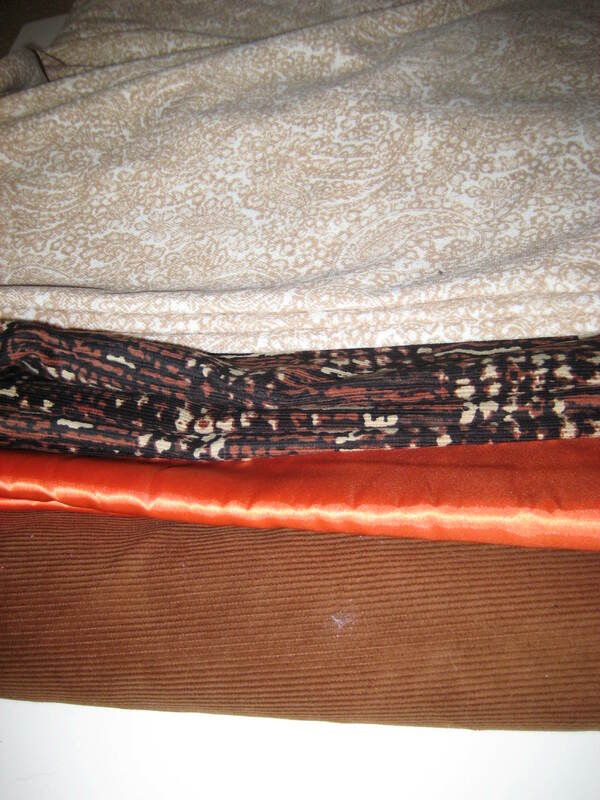 And with each project finished, and some that were never even started, I began to accumulate fabric scraps. And it was out of the fabric scrap pile, and from the back of my coat closet, that I came up with a no-cost-to-me option for a fall front door wreath! 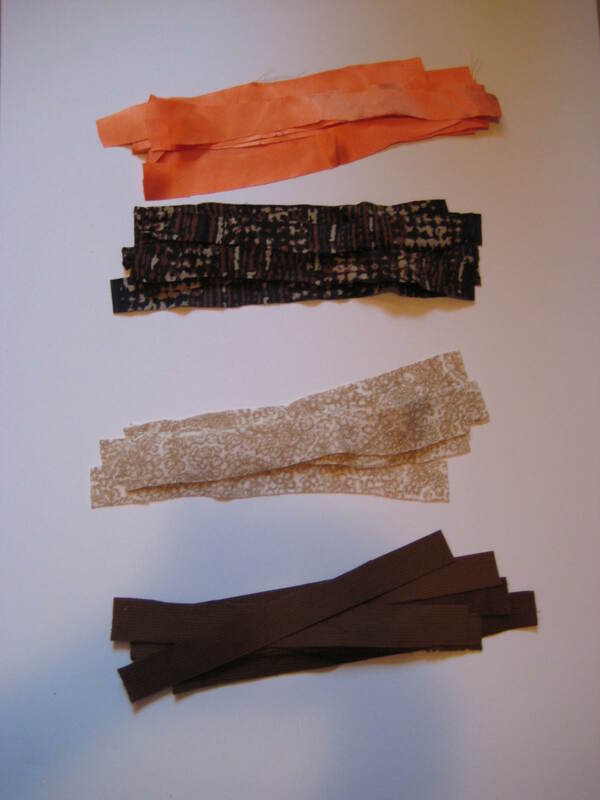 Then I cut the fabric scraps into strips that were approximately 1 inch by 8 inches. Exact precision is not needed, which is another reason I like this project so much. 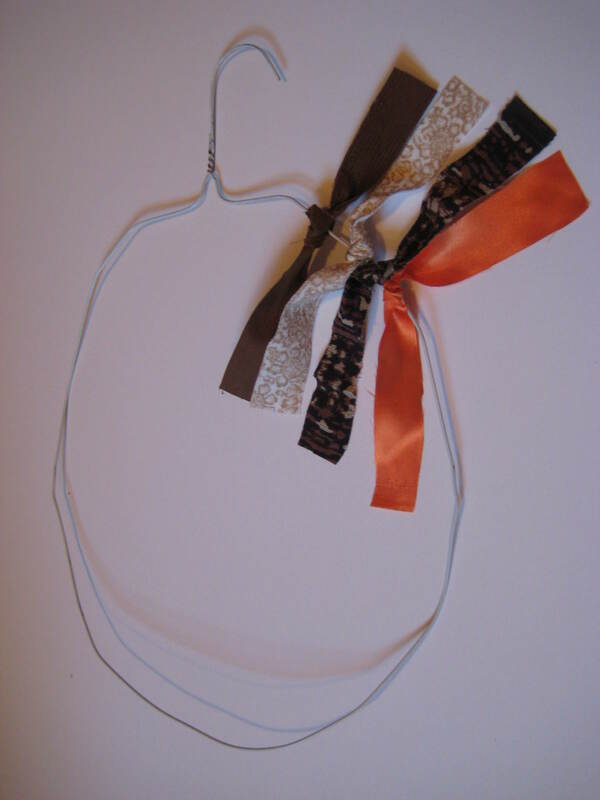 I tied the scraps of material in a pattern around the hanger, using around 120 scraps total. 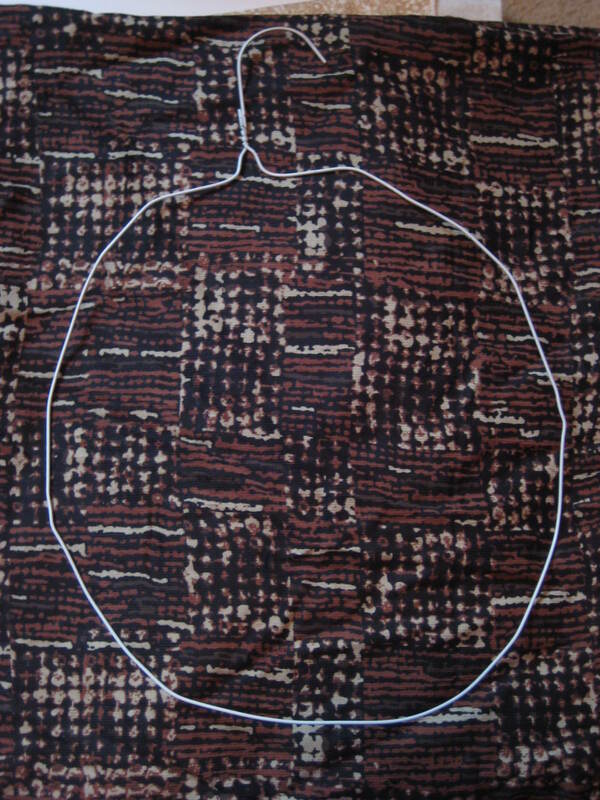 I bent the hook of the hanger into the loop to help it to stay on the door more securely. And in less than an hour, I had a new free-to-me fall wreath! Today, Ken and I went for our second round of vaccines. We each received three vaccines, one of which was the dreaded yellow fever vaccine. You know it’s going to hurt when the nurse specifically told each of us before she even started to give it to us that we must not pull away while receiving the vaccine. Funny, she had never mentioned that with the others. But there was good reason for the instructions for the yellow fever vaccine, although the others weren’t spectacular either. And, as usual, I feel crummy after the vaccinations. The wheezing started while I was still in the office, and now my throat is raw, my head feels like it’s going to explode, and I feel generally yucky. I’m know I’m mildly allergic to some preservatives in injections, but we’ve never isolated which ones because I’ve never had a full-blown anaphylactic reaction. An allergic reaction is definitely better than yellow fever. Or polio. Or meningitis. Or hepatitis. Or typhoid. So it’s worth the risk, as long as my epi-pen is handy. But now the worst of the shots is over, and I just have to go back for one booster in February, to confer lifetime immunity. There’s a good chance we’ll even travel before then. We actually have been so thoroughly vaccinated now, we are good to travel just about anywhere, except rural areas of Asia during Japanese encephalitis transmission season. But our hearts are set on Kinshasa, and every needle stick, aching arm, low-grade fever is worth it to bring our kids home! Ken and I had our appointment for fingerprinting today at the local support office for Immigration. We’ve been to many Immigration offices and appointments. When Ken came to the United States, he took the “scenic route” to getting his green card — working under a religious worker visa first. There was a difficult and incredibly long transition to get his green card. Five years of paperwork, Immigration errors, appointments, letters, hundreds of dollars, waiting, waiting, and more waiting finally resulted in his green card. And each time we went to one of those Immigration offices, there was a palpable sense that life as we knew it was threatened. Today was different. Today was about adding to our family without fear of, well, subtracting from our family. The officers were pleasant, efficient, and engaged in amusing chit-chat. In fact, we had a good time! Now that’s a first!